From the time we were married 25 years ago, Richard and I have enjoyed celebrating Christmas with his family. On Christmas Day, we’d load up the car with gifts, food and treats and head over to his sister’s house. With no children of our own, it was exhilarating to see the holiday through the eyes of our young nephews and niece. It was magical, delightful and filled with gleeful anticipation. As they grew older, the season still held beautiful festivities, but instead of visions of sugar plums dancing in wee little heads, we created new memories. More mature, maybe more solemn, but moments in time still etched into the deepest corners of our hearts. Change is like that. Sometimes it is welcome, expected, natural. You wouldn’t want the same presents under the tree you asked for at five when you were twenty-five, would you? But then change can also be harder, a bit pushier and very unnatural, like a diet or trying to quit smoking. And what if the change isn’t your idea, like a layoff at work or a bad medical report? Hardly anyone is interested in that! This Christmas ushers in a huge personal change. For the first time since I married Richard, we won’t be going to his sister’s cozy house in Illinois to enjoy time with family and friends. Instead we’ll be celebrating our first California Christmas as a couple. As excited as I am to be together in our new home state, there is also a touch of fear. Will our holiday be as rich on our own? Will this allow us to create some meaningful new traditions? Or will we miss the loud boisterous unwrapping of the presents and the constant stream of conversation around the dinner table? For the first time ever, God would dwell on earth, coming to be with His people. What a drastic change! For over six hundred of years, God had been silent. The earth yearned for His arrival. 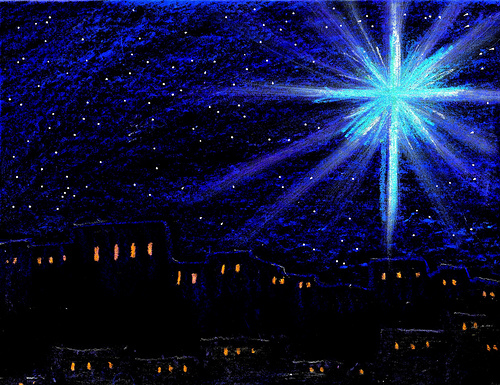 And then during those early morning hours on the day Jesus was born, everything about the world was transformed. God would be with us like He had never been before. Which turns my anxiousness about a new way of celebrating Christmas into a question: Does God allow change in our lives so we experience His presence in a new way? More than anything else, I want God beside me. And it seems one of times when I feel God the closest is when changed is forced on me. Emotions always run high around this holiday. Maybe this is the first time you can’t be with the person you love on Christmas. Or maybe you’ve set your holiday expectations so high, the reality of Christmas morning will pale by comparison. Maybe the change is blissful – you are rejoicing in news you never expected to hear. Whether good or bad news, this new, uncomfortable territory will always hold the promise of God’s all-caring presence. With His birth, Jesus changed the world from hopeless to hope-filled. With His presence, He moves our heartaches towards His grace. We may long for something we honestly think is the very best outcome for us. However if we willingly wait for His resolution, we find Him giving us gifts that bless the ever-changing landscape of our lives. Christmas says we all need change and God is willing to carry every single one of us back to heaven. If you fear an uncomfortable change right now, take heart in knowing His glory in the highest runs down to meet us who are at our lowest. And if the change is new, exciting and welcome, thank Him for creating that transformation. 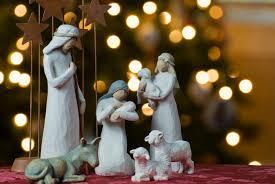 Christmas is, at its heart, God remaking us. On the first Christmas night, God overcame the world’s suffering by laying aside His power and becoming a helpless baby. Throughout His life, He demonstrated how to turn the other cheek, go the extra mile, seek peace and grant forgiveness. He quietly laid Himself down so that there might be the best change ever in this world – peace on earth and good will towards men! This entry was posted in Improving Every Day Living, Improving Relationship, Joy and tagged contentment, Creation, encouragement, friendships, God's love, grace, Joy, life, presence of God, purpose, relationships, Rescue, Salvation, unceasing prayer on December 25, 2015 by Myra Wells. Working for a major hotel chain after graduation from college, I came to adore the time between Thanksgiving and Christmas. Right after Turkey Day, holiday decorations transformed the lobby from a normally utilitarian meeting spot to a glowing, sparkling space to celebrate community. Throughout the month, the guests changed from road-weary, often cranky business travelers to happy singles and delighted families visiting loved ones in the area. I’d generally request to work on Christmas Eve or Christmas Day even after I had the seniority to have them off. A magical shimmer floated in the air those days and I wanted to share it with as many guests as possible. More than you’ll ever know, I miss that stimulating feeling of expectation. I still enjoy the Christmas season. There are cookies to bake, parties to attend and all those Christmas cards I mail out. But while I decorate the tree, I don’t sing as many Christmas carols. Even though my life goes into overdrive this time of year, most of my activities are solitary – not part of an amazing team and not for such a large group of wonderful people. My Advent has changed from something boisterous and exhilarating to a calmer, introspective time. Maybe that’s a good thing, though. Advent is a time of preparation, remembering His coming and yet longing for His return. It begs us to still, to hush, to quiet our souls so we can focus more deeply on the One whose birthday deeply transforms us and the world. Jesus came quietly, slipping unnoticed into a little town. He arrived in the middle of the night, in the dark, but suddenly there was the Light among us. And this Light brought with Him hope. His newborn cry broke the silence that had lingered over the world for 400 years. And while most inhabitants of the world were asleep, the earth could not contain its joy. Angels appeared, the Christmas star illuminated the dark sky and I imagine even the animals in the stable knew something momentous had just happened. The following day, most folks went back to the hustling of their lives. They wouldn’t know the beauty and magic of Christmas for many years to come – not until Christ’s death on the cross, if even then. The birth announcement was there that morning, but to catch it, you had to care enough to watch for it. Most didn’t, staying blissfully unaware of the miracle in their midst. The day’s joy was swallowed up instead by mundane activities. I suspect our lack of rejoicing exists to this day for much the same reason. When we hurry and rush, if we’re honest, we fail to rejoice. We can’t pause life, though we’d like to try. But we can purposely pause in this season, to hush, to still, to advent. To take the time to be left breathless by the awe-inspiring work of God all around us – the endless treasures that come to us through Him. This is what the Advent season is all about: looking with anticipation toward the Christmas child. We only need ask our Father in heaven to clear space in our hearts so we stop, seek, care. Advent gives us liberty to implore God to help us reveal in the gift of the Christmas child coming to earth in humble glory and splendor. The very best thing you can do with your life is build one with hope. So take some time to slow down, open your hands and your heart to the only one who can offer that hope. This God who came to us as a baby in a manger takes broken, hopeless hearts and gives you His. Not just during Christmas, but always. May the infinite love of Jesus bring you hope, peace and joy during this season and throughout the coming year. This entry was posted in Improving Every Day Living, Improving Relationship, Joy and tagged contentment, encouragement, God's love, grace, Joy, presence of God, Rescue, Salvation, surrender, winter, wondering on December 20, 2015 by Myra Wells.